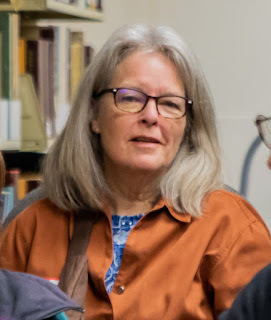 Lorna Wallace at the 2019 Annual meeting. CGS is staffed and run entirely by volunteers, many of them dedicated people who serve quietly behind the scenes. This is one in an occasional series recognizing our unsung heroes. I spent about four hours at the CGS library this past Saturday and surreptitiously watched Lorna Wallace perform her Desk Volunteer duties. 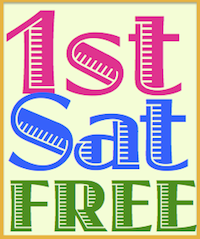 There were two classes that day – Ron Madson taught the Beginning Genealogy class, since it was the first Saturday of the month. Later on, we had a full house for Pam Miller’s ongoing DNA lecture series. Saturdays are typically one of our busiest days so the Desk Volunteers face a lot of work. I could not help but notice how proactively Lorna assisted our many visitors. When I arrived, she was focused on clearing a paper jam in the copier. She actually had the manual out and was reading it! That is something I would never consider. A few minutes later CGS member Gary Kneckt arrived. Gary is a personal friend of mine so he and I were chatting. Lorna quietly approached us and I thought she might chide us for talking too loudly but instead, she joined our conversation and a few minutes later was proactively helping Gary with the research he came to the library to do. I went back to my blog post on our New Hampshire books but was very aware of Lorna offering several helpful suggestions to Gary. Once Gary was off on his own Lorna returned to the desk, greeting patrons as they arrived. When she stepped out of the library briefly to get some coffee she made a point of asking me to “be in charge” in case someone came in. Lorna processed a patron’s application to join CGS, and I helped with a second new membership later on. I later saw her sit with a gentleman who arrived with a folder full of articles about his family and questions about how to find people on Ancestry trees. Lorna assisted this patron with a few questions and when stumped by one of his queries she asked me if I could possibly help. I did and then left them to it returning to my blog post research. When I left the library, Lorna was still engaged with this man who seemed to welcome the help and personal attention he was receiving. “It takes a village” - and volunteers like Lorna Wallace - to provide a vibrant, welcoming genealogical society. Next time you visit our library, don’t forget to look around and notice all that is going on and all of our many volunteers who are making it happen. Thank you, Lorna.